Alpine Poppies are cute little alpine plants. They come in a variety of pink, yellow, orange, and white. The foliage is an olive-green. They will bloom from late spring to late summer. Alpine Poppies will grow to a height of 6" to 10" tall and 6" to 10" wide. Plant Alpine Poppies in full sun and well drained soil. 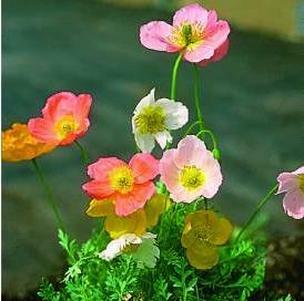 Use Alpine Poppies as an edging, in a Rock Garden, Miniature Garden, Moon Garden, Alpine Trough, or in containers. These are deer resistant and will become drought tolerant once they are established. These perennials will reseed. You can use these little beauties as a cut flower in an arrangement. Alpine Poppies are also a Firewise Plant.